If you are trying to figure out how to get rid of termites, we have good news for you! 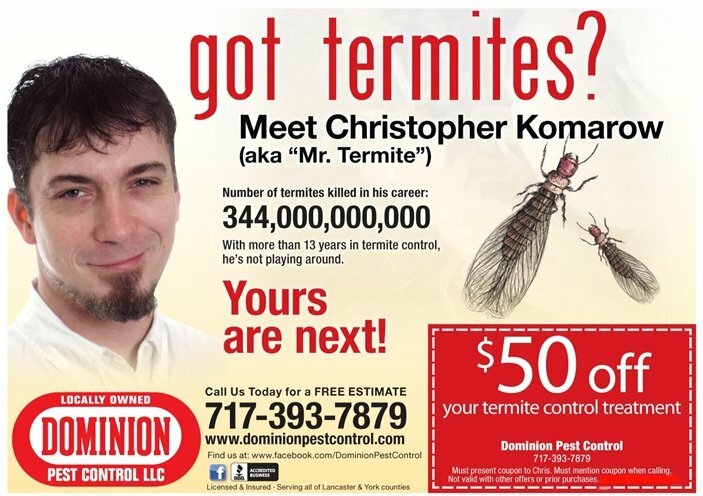 Lancaster and York’s truly local termite company, Dominion Pest Control, has experts on staff who not only knows how to identify a termite infestation in Lancaster and York, but knows how to get rid of the entire termite colony. Our team will dig, drill, and pump termiticide into an affected area, striking the termite colony with a death blow. Our technicians make termite control a reality, rather than a daunting and never-ending battle that can cause serious structural damage to your home. Dominion also treats for other wood-destroying insects such as carpenter ants, carpenter bees and wood boring beetles. Dominion even offers preventative treatments with a warranty and WDI report real estate transactions and for home inspections reports. Termite treatment is within reach; call us today at 717-393-7879 to get started!